Searched, nothing exactly matched it. Extremely similar to MC-11963. 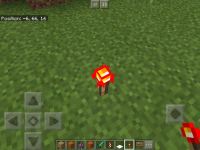 The inner face of a redstone torch does not render if viewed from behind, where it probably should.